So what do your teams look like for 2011? Auburn will likely have an 8 or 9 win season. We have a lot of YOUNG talent. We're expecting another Top 4 recruiting class and will possibly take the recruiting title this season if all of the pieces fall into place. We'll see how that goes. That is at least 8 starters on offense. OUCH! That is up to 7 starters on the defensive side of the ball. Talk about being a young team! We are thin in almost all areas in experience, but we also have a ton of talent in nearly all positions. We have a lot of tough road games this year, so I think this is going to be an experience-gaining season for the Tigers and then leading into a potential title shot in 2012 (favorable schedule, experienced sophomore/junior-heavy team, etc). The SEC also doesn't look like it will be in a position to compete for a title. LSU and USCe are the two likely championship contenders, but neither are what I'd consider "great" teams (not by our recent standards). I'll suggest an early national championship of Oklahoma versus Ohio State. I'm a Michigan State fan (don't sling any arrows my way) and a staunch NON-UofMich fan. That being said, one of my son's HS hockey teammates (Desmond Morgan) has committed to UofMI football so I may have to watch (and will cheer for him if/when he plays). Maybe. That's tough. Being a UF fan, I'm trying to imagine pulling for FSU in some small way. But I can't! I know a couple Spartans. And they were quite happy this last season with MSU doing well and UM not doing so well. Final few days of recruiting. It looks like UGA will finish really strong. UF may steal Marcus Roberson from us ... hoping not, as we need the help at DB yesterday and he would start immediately. We should close pretty strong. FSU is projected at finishing first or second. Auburn, Alabama, and Georgia should all finish in the Top 6 or so. Florida remains mysteriously absent. Interesting to see how this class will finish... do we sign Cyrus Kouandjio or not. If we do, we will finish atop the Scout team rankings. If we don't, we'll slide to around 6th or 7th on each of the recruiting services. UGH! I agree completely. Hopefully this will one day come back and slap him in the face. As some of the higher profile players are starting to come to light, such as B.J. Scott and Star Jackson, I think it will have a little more impact. Parents should really take note of this, though. They praise the Alabama staff for their business approach to the game... you can't get any more business than this, though. Pulling this one out of DF's bag of tricks ... games/wins against the all-time top 30 winningest programs. A measure not of what you've done all-time against all opponents, but what you've done all-time against the best all-time programs out there (including Auburn, Florida, Alabama, Nebraska, Oklahoma, and many others). Considering it the all-things-considered strength of schedule measuring stick. For today, I thought I'd show the 13 members of the 700-win club and what their numbers look like against the Top 30 programs on the All-Time Wins List. * I also added 4 teams this time around. There are four teams that have played fewer than 1000 games, but have a winning % of .620 or greater. That would be top 20 all-time on the winning % list, but they haven't played enough games to be in the Top 30 All-Time Wins list. They are: Miami, Florida St, S. Florida, and Boise St. So I included them in these numbers. This is a list of the % of a programs total games played against Top 30 programs. For example, Oklahoma has played 1169 games, 381 of which were against Top 30 programs. That's 32.6%. This list is even better. It's a list of the % of a programs' wins that have come against Top 30 programs. For example, Oklahoma has 809 wins, 206 have come against Top 30 programs. That's 25.5%. Cam reportedly signs a $1m+ contract with Under Armour. It is said to be the biggest NFL rookie apparel contract in history (bigger than Reggie Bush). Excellent use of ryegrass seed! 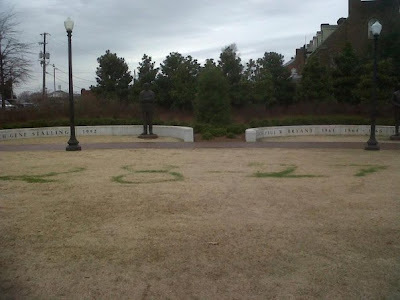 I really hope the Alabama fan responsible for this is found and convicted to the full extent of the law. A similar, non-football related act against the Treaty Oak in Austin had the felon sentenced to nine years in prison. I hope the idiot Alabama fan gets far worse. The idiot had enough balls to call in to the Finebaum show and brag about it on national air! He knew exactly what he was doing. Tebuthiuron is lethal to trees. And he put it out there in a dose much higher than that required for activity. It is also very water soluble, so any chance to save the trees is probably long gone as it's been out there for some time now. They have applied liquid activated charcoal as a last hope. I could see AU replacing the trees. Arborists are getting pretty good at being able to move fairly large trees. What an idiot. He deserves to spend some time in jail. If for nothing else but having a very low IQ. I'm waiting to see the federal charges brought against Ole Harvey Updyke. There seems to be some interest surrounding Ole Harvey's landlord and close friend, Wayne Barnes, as well. He is known as "FLORIBAMA" on TiderInsider.com and has some of the below gems from the past two months... what an f'n idiot! What would happen if I was caught trying to cut down that damn tree? more then putting a jersey on Bryants statue. This will kill the auburm fambliy. it will make the papers I HAVE A PLAN! Some need to get a life. Amazing, the breadth of stupidity. I simply can't fathom caring that much about a football team. Spike 80DF is the trade name of the herbicide used. Manufactured by Dow Agrosciences. This story made the ABC National News this evening. I'm betting that the good people of Auburn along with a lot of sympathetic people from all over will find a way to at least partially replace these trees. I know it will not be the same as the Toomer trees were somewhere at 150 years old or more. But as I mentioned earlier, arborists can and do move large trees these days. It will require significant clean up to make sure the herbicide is gone (tebuthiuron is very persistent in soil with a half life of more than two years). Check this out: Relocation of 40" Live Oak | Florida State University, Tallahassee, Florida | Universities | Environmental Design, Inc. I sent an email to the Opelika-Auburn News editorial staff about the FLORIBAMA posts and they ended up running the story. Quite neat! It is actually on the front page of the Sunday edition! Here's an interesting article about the Toomer's Oaks from a few years ago. At the very end, it discusses what the plans were going to be over the next couple decades. I was under the impression that they had original seedlings dating back to the early 80's, but it seems the earliest are now only 10 years old. One day, they will find their way to Toomer's Corner. Pretty interesting. Now that I've seen the trees, I realize that they are not that big. Trees that size can be replaced. The tree moved at FSU was bigger than those. My guess is that Auburn will replace the trees and do it in a way that will ensure their long term health. Like giving them more space around the base of the trees. We'll see. Wow. Page 6. Those trees are dead meat. No way to save them. I understand that they need to look like they are trying to save them, but they should move on. They need to concentrate on getting the herbicide out of the soil. Activated charcoal applications are a good start. They will end up replanting some new oaks eventually. That's just too bad. They dug up a ton of soil over the last week and put in more activated charcoal and new soil. They're racing against the season, as spring will mean that the trees will start "feeding" more. Monday begins concrete work, but I'm not sure if they're focusing on the roads - which are the two busiest in the city - or if they're looking at the sidewalks and brickways. They are attempting to look at the root system of the trees. Otto, how are the trees faring? Haven't heard much about them in the press lately. Been absent for a minute. The last I heard about the trees is that the efforts being made are very likely to pacify the fanbase and that there is little to no chance that they will survive. Nevertheless, that information could be outdated by now. "A very good source on the subject told me the Toomer’s oak trees are doing better than expected thanks to an extraordinary amount of work that has been done in an attempt to save them. The tree on Magnolia Avenue is doing better than the one on College Street. However, it is too early to know if one or both can survive the poisoning. A major test will be getting through the stress of a hot summer."